Putting a focus on science and engineering is a major goal of the Boston Public Schools. We want all students to be scientifically literate and to develop an understanding of fundamental science and engineering concepts. Each year the Boston Science and Engineering Fair provides an opportunity for students to “do” science/engineering. As the students prepare for the fair, they not only learn important science and engineering concepts but they also learn how scientists and engineers investigate the world. 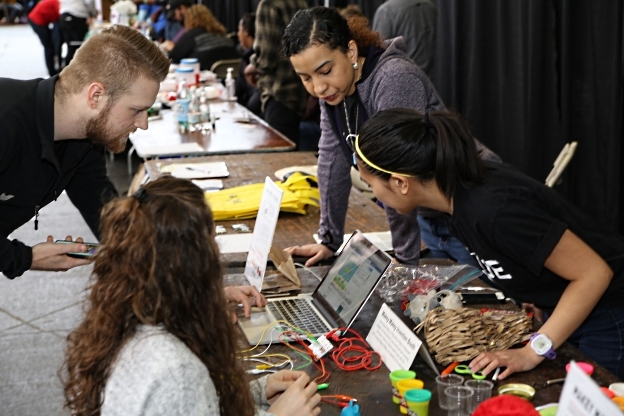 During the fair, which will take place at Northeastern’s Cabot Cage, we run a tabletop activity expo alongside the student’s projects, in which various STEM organizations demonstrate a STEM-related exhibit or short activity. The STEM activity Expo takes place from 10:00am – 12:00pm and 1:30pm – 3:00pm (lunch provided between). If you are interested in participating this year, please Sign-Up Here!